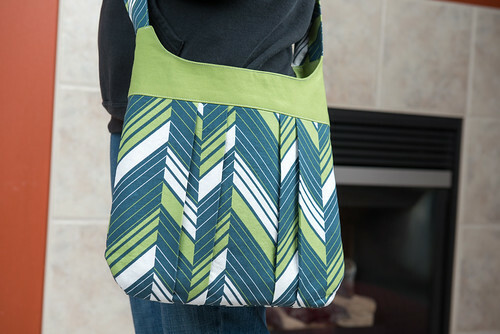 You might remember the Retro Bag that I made for myself toward the end of last year. Shortly after I got the One Yard Wonder books (one and two) my sister was looking through them and noticed the Retro Bag. She mentioned that she liked it and well, to be honest, when I made one for myself, I completely forgot that she told me that she liked it. I kept telling her that I was going to make her a bag, but I didn’t really know what fabric she would like. So each time I saw her, I would try to get ideas of what fabric she liked. Finally, I decided that she liked blues and found this (dear Stella Ikebana Ziggy Stripe Charcoal) from Pink Chalk Fabrics. 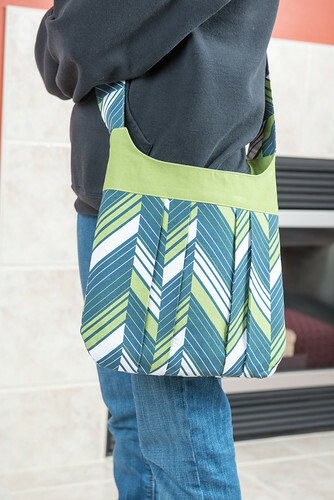 I sent her an email with links to multiple fabrics I thought she would like and this was her favorite. So I ordered some! I decided that I was going to use a solid color for the lining. I purchased a Kona color card just for projects like this. Unfortunately, I had to wait until I received this fabric before ordering the solid so that I could perfectly match the colors, but I’m ok with that. I am cheap frugal? so I tend to wait until I can find fabric on sale. (I guess that is the accountant in me.) I also had a few other solids that I wanted to order, so it worked out. I asked my sister if she wanted the green or the blue as the solid color and she chose green. Which also was my first choice, so I was glad she chose the green. The bag turned out just how I was hoping and my sister seemed to really like it. Which is always a bonus! If you remember from my post about the one I made for myself, I mentioned how the strap was slightly thinner than the top part of the bag and that I wasn’t sure if it was supposed to be like that. Well, it turned out the same way this time, so I am officially saying that it is supposed to be like that. The pattern calls for O-rings and I have yet to find any that I like so I eliminated them on the bag once again. If you know of somewhere to purchase them, please let me know! I prefer the flat ones so they look more decorative. One more thing…did you notice the new blog design? My husband took it upon himself to completely redesign the blog. Isn’t it great? Clean, fresh, and easy to navigate. Hopefully you can easily find the projects/topics/etc that you are looking for. Let me know what you think so I can let my husband know. Also just tried to post this comment and it wouldn’t let me without entering a website. I would guess that most people don’t have one so they would therefore be excluded from commenting. Perhaps set the field to allow it to be empty. I think we might possibly have the O-rings you want at Hancock Fabrics. I don’t work until next week but will look. I think we have some metal (maybe) and some plastic ones. I have used both and was okay with them. If we still have them, I can email you a picture. Can get some for you too of course if you want. 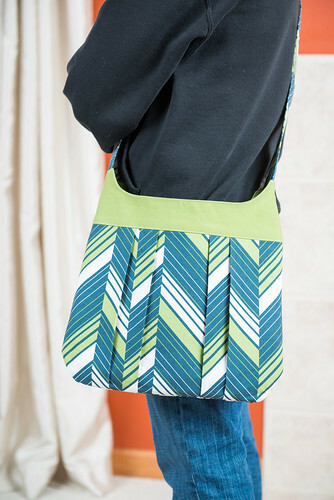 Pingback: How to Sew a Pleated Shoulder Bag - Free Sewing Tutorial from Nap-time Creations | PatternPile.com - sew, quilt, knit and crochet fun gifts!